Where can you have a great Sunday brunch if you live in one of the wealthiest counties in America? Oakland County, just northwest of Detroit and the lucky beneficiary of well-paying jobs in the auto industry and elsewhere, is among one of the wealthiest among counties with a population of more than one million residents. But it's not only affluent it's also packed with possibilities as one of the most populous county in Michigan. If you lived in Oakland County, you wouldn't gravitate toward the International House of Pancakes or Bob Evans. You'd want something a little more interesting. Here are more than a dozen restaurants in some of the county's prettiest towns that can make brunch (or breakfast) an event. They include everything from casual bistros to fancy restaurants, locavore retreats to homey pancake dens. Birmingham and Royal Oak locations stand out for choice and quality. Take your pick and be sure to check websites for current menus, hours, and prices before booking, and check in with social media for customer satisfaction snapshots. 220 Merrill: If you want to be seen at brunch, this is the place for pretty people and pretty food. Get your cocktails from the bar and order chicken and waffles or make your own omelet. Address: 220 East Merrill Street. Commonwealth: You can enjoy breakfast and lunch items made from scratch. This spot makes everything in-house, oftentimes with local and organic ingredients. As a bonus, most meals are less than $20. La Strada Dolci e Caffé: Patrons say this place reminds them of Italy, and why not? Everything about it reads Italian. You could take it easy with tomato-basil bruschetta, Italian meat and cheese board, and a cappuccino. But if you're with a group, go ahead and fill the table with Mediterranean small plates and wine, throw in some delectable pizza, then finish with a basket of flaky pastries and big cups of really good coffee. Address: 243 East Merrill Street. Bill's: Very Ivy League, Bill's calls itself "a classic, comfortable social club." There is a dedicated brunch menu for the weekend with healthy options such as steel-cut oats and farro, grapefruit warmed under the broiler, and a kale Caesar salad. But there's also brioche French toast and a Croque Madame. Your choice. The Fly Trap: Brunch goes on all day, every day at this inexpensive, campy diner. Try the green eggs and ham or "eggs ala boring" (just eggs) with house muffins. The chef might be happier if you ordered something such as the Fire-Breathing Dragon made with grilled chicken, wheat noodles, basil, and sambal peanut sauce. Kudos for imagination. You might have seen this chummy place on the Food Network's Diners, Drive-Ins, and Dives. GreenSpace Café: Started by a cardiologist who wanted to pioneer "a ful­ly veg­an, plant-based bar, and eatery," GreenSpace Café unveiled a new weekend brunch to eat at the restaurant or to take out. There are starters (think almond milk chia pudding), main courses such as country biscuits and gravy with seitan sausage, and sides that range from blackened tempeh to spicy pinto beans. Address: 215 West Nine Mile Road. The Breakfast Club Restaurant: This homey place, which feels like you're visiting friends in a cozy house, is beloved by its patrons. The generous portions of uncomplicated, yummy food might have everything to do with that. Think salmon Benedict, waffles with eggs and home fries, and breakfast nachos smothered in scrambled eggs and veggies. Address: 30600 John R Road. Park 600: Located at the Royal Park Hotel, Park 600 offers a weekend brunch that is simple and good, ranging from very healthy to not so much (but delicious). You can have a cholesterol-free egg-white frittata or a fully loaded country breakfast with every fat known to brunch, a romaine-egg-blue cheese farm salad, or hot Irish oatmeal. These are difficult choices. Reservations recommended. Address: 600 East University Drive. Ale Mary's Beer Hall: Named one of the Detroit area's best new restaurants and one of its most sociable, you could sit at communal brunch tables and down beermosas with your Scotch eggs, fluffy fresh cornbread and poutine (the French-Canadian classic of beer-battered fries smothered in gravy and cheese curds). Top this off with a desert of beeramisu, and wash it all down with a flight of craft beers. Address: 316 South Main Street. Bistro 82: This upscale eatery serves modern American dishes in a clean-lined dining and bar space. The place has a thing for oysters and other fresh shellfish, so you'll find plenty. A dozen chilled oysters and sauces could be a fantastic brunch for two with orange cauliflower (sesame, ginger, orange marmalade, veggies, and cashews) or goat cheese salad and whole wheat epi bread with house-cultured butter finished with cinnamon-sugar beignets for dessert. The Champagne and wine lists are memorable, so go ahead and indulge. Address: 401 South Lafayette Avenue. Lily's Seafood Grill & Brewery: Kids are welcome here. Hopefully, they'll sample some classics, such as beer-battered fish and chips or Lily's crisp calamari over roasted red pepper relish. Cultures have a place at the table with Mardi Gras hash of andouille sausage, crawfish, shrimp, and veggies or a full Scottish breakfast of fluffy scrambled eggs with blood pudding, haggis, bangers, home fries, and Scottish white toast—all washed down with a microbrew. Address: 410 South Washington Avenue. Pronto: Pronto is much more than its breakfast menu. Why? Because the restaurant/deli serves the morning meal with such panache that it's a favorite with locals. The restaurant's omelets don't skimp on ingredients; plus, you also get garlic potatoes, fruit, and toasted challah or your choice of another fresh bread. Address: 608 South Washington Avenue. Original Pancake House: This is part of a 60-plus-year-old national chain based in Portland, Oregon. It doesn't get high marks for decor or food presentation, although some locations have charming outdoor seating. But the menu is first-rate, with dishes you'd be hard-pressed to find elsewhere, which is probably why there's a line out the door most weekends. 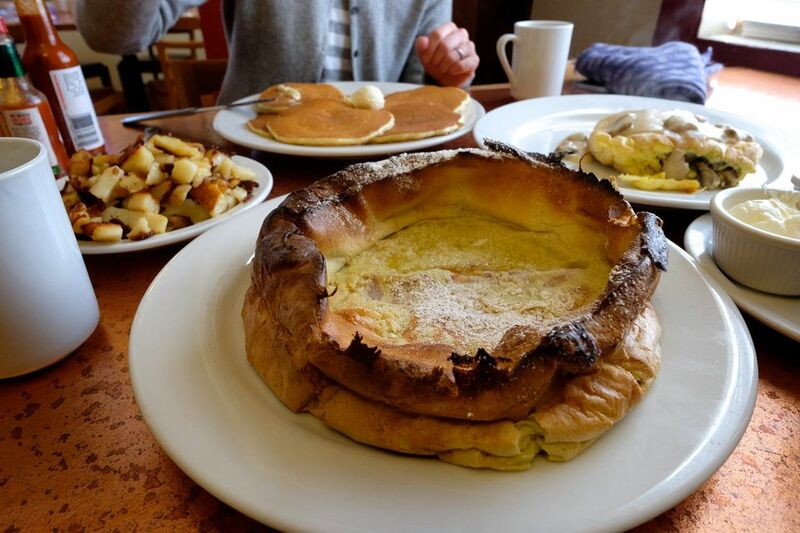 Try the amazing apple pancake baked with copious apples and cinnamon glaze or the homemade corned beef hash with five potato pancakes and eggs. Lingonberries accompany several dishes. Note in addition to the Southfield location, there's a second Oakland County spot in Birmingham. Address: 19355 West Ten Mile Road. The Root Restaurant & Bar: Named the best restaurant of 2012, The Root Restaurant & Bar is a casual, chef-driven place that prizes Michigan ingredients. Start with a classic brunch cocktail. Then get right to the brunch menu, which is packed full of homey riches. How about buttermilk biscuits or a pecan sticky bun, artisanal cheeses, house-made bacon or breakfast sausage, Michigan eggs, and French press coffee? Or whole wheat toast and coffee with the beautiful Root Orchard Salad for four: green apple, red leaf lettuce, Marcona almonds, dried Michigan cherries, saga blue cheese, pickled onion, house-made bacon, hard-cider vinaigrette and pulled chicken. Address: 340 Town Center Boulevard.